So my first post gives a long form of who I am and what I’m doing here. I highly recommend that you read that first even if you don’t read the rest of my older posts. 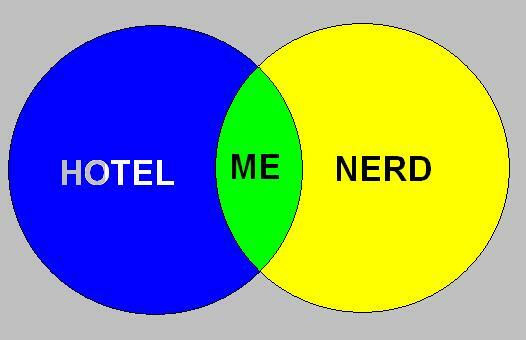 In short I’m just a nerdy guy that loves working in the Hotel/Hospitality Industry. I live in the wine country of Northern California. I majored in Hotel Operations in school and got my B.S. I love the business for a whole variety of reasons, not the least of which is I like helping people have a good time. I watch entirely too much TV. I play D&D and other tabletop games. I read comic books. I play video games. I read Sci-Fi and Fantasy literature. I talk about hotels and the hospitality industry here a lot, because it interests and fascinates me and it’s a business that gives you endless stories about people. I also talk about my nerdier pursuits and interests on this blog. It’s kind of a weird mix, but it’s who I am. Maybe not every post will be for you. Skip over it and go to the next one that appeals. Or read them all the way through. Whatever works for you.